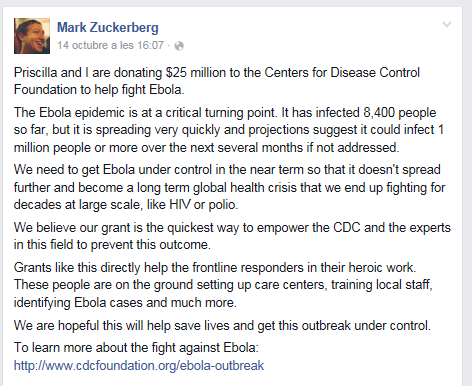 October 24, 2014: Mark Zuckerberg and his wife Priscilla Chan announced a donation of $25 million to the Centers for Disease Control Foundation to help fight Ebola. “The Ebola epidemic is at a critical turning point. 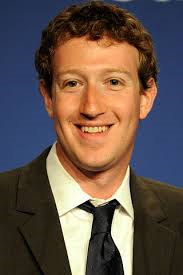 It has infected 8,400 people so far, but it is spreading very quickly and projections suggest it could infect 1 million people or more over the next several months if not addressed”, Zuckerberg said in a statement posted to his Facebook page (where if not?). The couple thought that their grant was the quickest way to empower the CDC and the experts in this field to prevent Ebola from being a global health crisis. Marck Zukerberg statement on Facebook. October, 14 2014. Many of you may also know another example of “altruism” that went viral on social networks this summer. Exactly! That consisting in dumping a bucket of ice water on one’s head to promote awareness of the amyotrophic lateral sclerosis (ALS) disease and encourage donations to research. 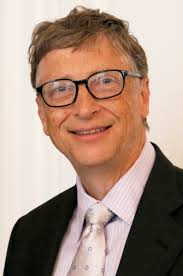 Bill Gates accepts Mark Zuckerberg’s ALS Ice Bucket Challenge. August, 24 2014: ALS Association announced that it had received $70,2 million in donations from the #iceBucketChallenge compared to $2,5 million during the same time period last year (July 29 to August 24). A great example of how social networks can help an altruism campaign to succeed. Why do we help others? How do we define an altruistic act and how do we know altruism when we see it? Are humans selfless or selfish? Under which circumstances are we more likely to help? Altruism: Willing to help people without expecting anything in return. Selflessness became an object of study in 1964, after a twenty-eight-year-old woman, Kitty Genovese, was raped and stabbed to death in Queens (New York) just after three in the morning on Friday, March 13. According to the New York Times version, not one single person telephoned the police during the assault and neither helped her, despite knowing she was in danger. Approximately 38 of the neighbours came to their windows in response to the screams of terror, but no one did anything until forty minutes later when the aggressor had run away and Kitty was dead. Nowadays we know that this version was inaccurate in a number of significant ways, but in that moment the lack of reaction of numerous witnesses prompted research into diffusion of responsibility. Would you have helped Kitty? You may think so, but the truth is that under some circumstances the majority of us would have acted the same way. 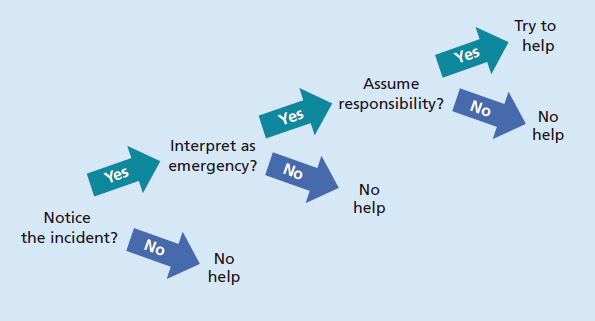 John Darley and Bibb Latané constructed a decision tree in order to show what steps people follow before actually helping a person. 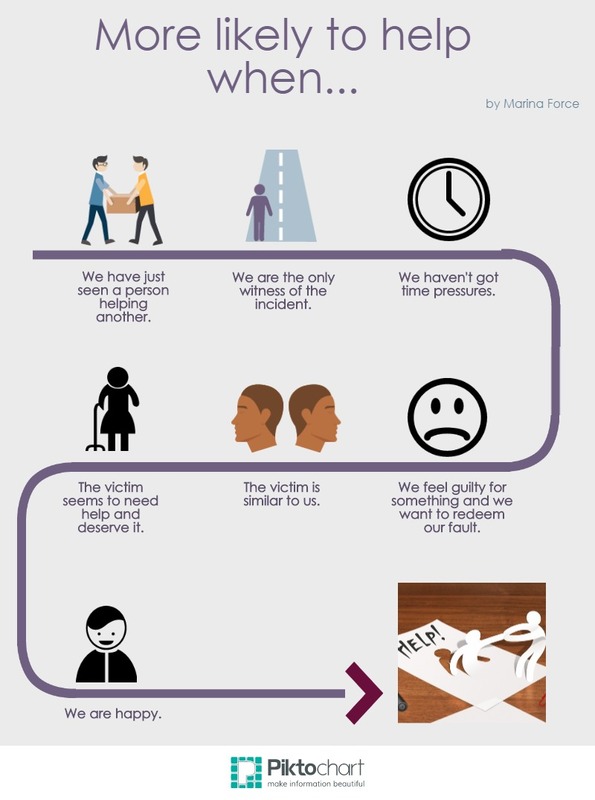 We will help someone just in case we notice the incident, we interpret it as an emergency and we assume our responsibility. According to the initial reports, those who saw and heard Kitty Genovese’s pleas for help detected the incident and interpreted it as an emergency, but nobody assumed responsibility. Why? Because there were many people watching the assault and that diffused the responsibility for action. Unbelievable, but true. That is what psychologists call the bystander effect. The victim is less likely to received assistance when surrounded by a group rather than a single bystander. Sometimes people do not want to get involved or are afraid to stand out from the crowd. Hence, they will not take action unless somone else does. Darley and Latané conducted an experiment in 1968 to see how much time people needed to react in a room filling little-by-little with smoke. What they found was that those working alone in the room usually hesitated a moment and then got up, walked over to the vent to check it and went to report the incident. Contrary, those working in groups of three remained stolid. Among the 24 men in eight groups, only one reported the smoke within the first four minutes. Why did nearly anyone react until the smoke was so thick to see anything? The lack of response was due to the group passivity. When perceiving the smoke, the participants glanced at the others and despite being worried, they didn’t move because didn’t want to appear flustered. In that kind of situations we incorrectly tend to think that everything must be okay and we do not interpret the incident as an emergency. When the experiment was finished all the members of the group assigned the smoke to “A leak in the air conditioning”, “Steam pipes”, but not a single participant said: “Fire”. 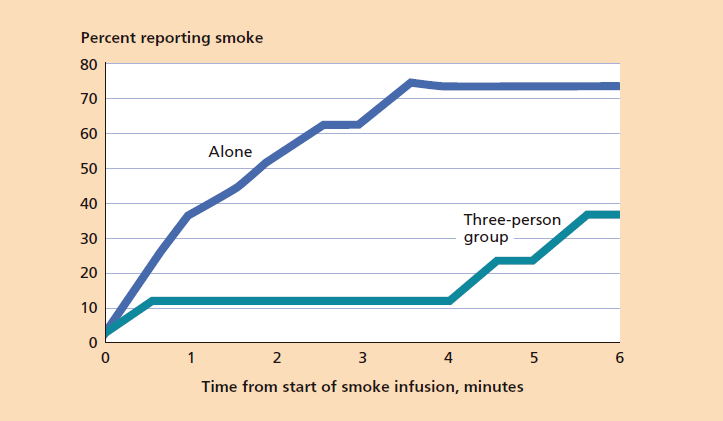 Smoke pouring into the testing room was much more likely to be reported by individuals working alone than by three-person groups. Source: David G. Myers, “Social Psychology” (2010). As we have seen, the probability of assistance is inversely related to the number of bystanders. But, under which circumstances are we more likely to help? We all have encountered difficult situations in which our help was required: a woman lying on the street, a stranded motorist on a busy highway… However, in these situations many of us have ignored the woman and the motorist and just few people have helped them. Why? What motivates assistance? A schematic diagram showing the theories that David G. Myers mention in his book “Social Psychology” (2010). By Marina Force. According to these theories, we only help other people when willing to take profit, when feeling we ought to and when the person who requires our help is a relative. But, what about the Good Samaritan? Does genuine altruism exist? Recently studies have proved so. When we feel genuine empathy, we help or assist others not to relief our own distress, but to relief the sufferer ones. In other words: when we feel compassion we help others for their own sake. Empathy seems to come naturally in humans, as well as in chimpanzees. Even children (who have not developed guilty feelings yet) seem to find pleasure in helping. How can we distinguish between a genuine altruism and an egoistic selflessness? The only way is keeping in mind that there is a huge difference between helping someone in order to feel good and feeling good due to a helpful action. And remember! : if you give a little love…you can get a little love of your own. Noah and the Whale, ‘Give a Little Love’. This song video clip is an amazing example to illustrate the reciprocity norm. This entry was posted in Sin categoría and tagged Altruism, assistance, Bystander effect, empathy, help, Latané and Darley, selflessness, smoke-fill-room experiment by Marina Force-Castells. Bookmark the permalink.